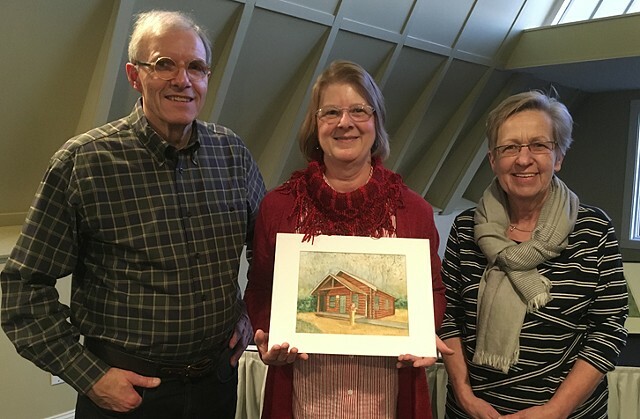 Artist Carol Luc presenting owners Slobo and Birgit Radin artwork for the permanent collection of the Goldmoor Inn of Galena, Illinois. Sue Reddel is a food and travel blogger who also participated in my artist in residence watercolor workshop at the Goldmoor Inn of Galena, Illinois in January 2017. Connie R. is a Midwest travel blogger who also participated in my artist in residence watercolor workshop at the Goldmoor Inn of Galena, Illinois in January 2017. Local news from the areas neighboring Dubuque, Iowa. Chuck Gniech, a professor of art, reviews exhibitions on this blog. Showing the work of over 400 local Chicago Artists. Photographic images available as prints from the American Frame Corporation. Every friday, students and faculty of the American Academy of Art gather informally to paint portraits. Artwork donated to the Art of Human Rights fundraiser at Gruen Galleries in Chicago. Pigs created for a fundraiser for St. Alphonsus/St. Pat's elementary school in Lemont, Illinois. “Our objectives are to focus public attention on art, agriculture, and our natural resources while creating new relationships between artists, farmers, environmentalists, and educators.